Clinic in village. Had to run the donkeys out first. God prepares each person for a ministry that will meet the specific needs for the people to whom they are sent. 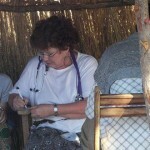 My training as a nurse has uniquely prepared me to meet the physical needs of the tribal people in the Tonga Valley. Sickness and death are the wages of sin, but the gift of God is eternal life. We are not offering these people a social gospel that is relevant only in this world. Instead, as I hold clinics in each village we make certain the people understand that the gifts of medication and medical care being administered come not at the will of man, but by the commandment of Jesus Christ. As surely as He can heal the physical body of the disease or injury, He can also heal the soul and grant eternal life to anyone who believes. The clinics are used to show the compassion of Christ and prepare them to hear what He has to offer beyond today. It will help us to open new areas where we have not been allowed to go, as the Zambian government will give me access to any village in which immunizations or AIDS treatments are needed. What diseases are still on the forefront in Zambia? The number one killer in all of Africa is Malaria. We are working to train the people in ways they can decrease their exposure to the bite of the mosquitoes that carry Malaria. It is harder in villages that are close to a river or stream, but villages with no open water source are encouraged to keep containers of water covered to prevent egg laying by the mosquitoes. We are also trying to provide as many mosquito nets as possible to protect them at night. The huts have small windows and one door, but none are covered with any type of screening. If they are covered at all, it is usually with just a piece of cloth that flutters in the wind and doesn’t keep anything out. Research has shown that if the huts on the periphery of the village have mosquito nets it protects the whole village. HIV/AIDS is the second biggest killer in Zambia. The numbers of active cases documented vary according to the source. It is very difficult to get the men to come and be tested or even educated on AIDS, making it hard to gain a true picture. Wikipedia states that WHO has placed Zambia with 13.5% HIV infected population. Clinics that I have been involved in which have been keeping records of positive HIV patients are getting much higher numbers, as high as 36%. This number is among expectant women. So if you factor in non-pregnant women, men, and children you will get a much higher number. The Zambian government has made HIV/AIDS education and treatment a number one priority, and the American people are giving generously to build new clinics there. However, we still need much more testing equipment, medication, teaching materials, and PRAYERS! Other illnesses sometimes vary with the time of year; dry season or wet season. Cholera increases dramatically during wet season. There is still plague in Zambia. Measles and Chicken Pox are still rampant even though the Government is trying its best to get the children immunized. In a country where the people are already compromised due to malnutrition and a large HIV population, a seemingly simple disease like measles or chicken pox can wipe out an entire village. Eye infections are frequent due to the blowing sand, as are sinus infections due to the prolonged dry season. There is no moisture during dry season (end of April until the end of October – NO RAIN), and the blowing dust creates the perfect atmosphere for sinus infections. Ear infections are also common during this time, and the primary antibacterial ear drop is a medication that can cause deafness. Remember I said that some of the deafness is due to the medications taken? Frequently children are burned in cooking fires. During dry season it is cold at night with temperatures dropping into the 50s or even 40s depending on the area. The first thing a mother does is start her cooking fire in the morning. The children all gather as close as they can, and inevitably someone falls in just trying to get warm. A traditional treatment for these burns is cow manure being smeared over the area. Of course, this greatly adds to the infection rate with the burn.